As everyone knows, the best place to hide from thunderstorms and firecrackers is in the faux fur blanket, as Oscar is demonstrating. This is what our dogs do during the dog days of August. In other news, I started the draft for the third episode of season three of Coffee & Ghosts and came up with 6,000 words, which isn’t a bad way to start off. I have layers to pull back and story threads to tie together. If nothing else, I’ve learned that writing a series is rewarding, fun, and challenging. I also started formatting my e-books with Vellum. Oh, how I love this program. True, I haven’t clicked on Purchase. Not yet. But I plan to. In the meantime, I can get a feel for the program and learn all its options–a true try-before-you-buy opportunity. I’m pretty much sold already. Additionally, Chicago Review Press contacted me and offered up an ARC of Women Heroes of World War II—the Pacific Theater: 15 Stories of Resistance, Rescue, Sabotage, and Survival, which I can’t wait to read. I loved the other two in the series (and reviewed them on my blog as well). So, writing, formatting, books to read. It’s been a good week. None, but get ready for the August issue of Deep Magic on August 16th! Or you can simply pre-order now. Not as dramatic as it sounds, but I started the third (and final) episode of Coffee & Ghosts this week. Now mind you, if I think up something for a season four, I’ll totally write it. But for now, I’m wrapping up most (if not all) of the story threads. It’s a bittersweet sort of thing. I’ve been writing about Katy, and Malcolm, and all the ghosts for more than a year now. I’ve been writing a little bit slower because I’m going to miss them. It’s also the beginning of the end of the 99 cent launch price for The Shapeshifter Chronicles. So you might want to get yourself a copy. Otherwise, just some tutorials and some reading. Last few days to get the The Shapeshifter Chronicles for 99 cents! The price will go up mid-week, so grab your copy now! It’s here! It’s here! The Shapeshifter Chronicles is live over on Amazon, with a print version coming very soon! A refreshing and original take on a classic fairy tale, flipping traditional conventions on their ear while remaining an enchanting and mesmerizing story about unconditional love. I’m so thrilled to be part of this fabulous anthology. And it’s only 99 cents for the time being, so go grab a copy! In other news, I finished episode 2 in the third season of Coffee & Ghosts and started brainstorming the third. Plus! I sold a short story this week as well. It was one of those weeks where I have something in every category. I like those weeks, even the rejections–it’s all part of the process. With Hair of Teeth and Claw in The Shapeshifter Chronicles. I didn’t quite finish up Coffee & Ghosts. Tomorrow, definitely. This weekend? We’re heading out for some fun, taking some out-of-town guests to the Mall of America (which is really the only time I go, more or less). We will probably eat some delicious food, although not the sushi burritos. I haven’t tried them but they sound like the perfect food for my son. Next week brings some fun things. I have a story in a forthcoming Future Chronicles title, the Shapeshifter Chronicles, which will be released on July 30th. So part of this week I spend reading the advance author copy for any last-minute fixes and formatting issues. More about that later in the week. In the meantime, I hope everyone in the northern hemisphere is enjoying their summer. Stay cool! I have a whole lot of orange in my submission tracker. I suspect summer is the culprit and everyone is doing what the dogs are doing–napping on the screened-in porch. Another quiet week with some writing and formatting and other things that aren’t all that exciting. Despite the slow and steady pace (or maybe because of it), I’m in the home stretch of episode two of Coffee & Ghosts, and I really hope to finish it this week and start brainstorming the third (and final?) episode. Another weekend at the lake, and what do I discover? Tupperware! 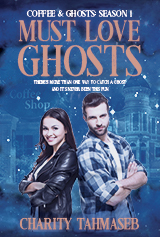 For those of you not familiar with Coffee & Ghosts, the main character, Katy, uses Tupperware to catch ghosts (and coffee, usually Kona blend). I’m pretty sure I’ve uncovered the spot where Katy buys her Tupperware, at least some of the time. Just look at the sign. It was, after all, voted the best flea market in Minnesota. And look at all that lovely, rainbow variety of Tupperware! Otherwise, a quiet week for a little writing, some formatting and promo work, and I did manage a submission. The dogs have decided a good place to spend the summer is on the screened-in porch, watching the kids. This is also an excellent place to read (for me, not the dogs). Some writing this week, some formatting work, and so on. Lots of reading. One rejection, and I have a few stories I should send back out again, which I hope to do this week or next, along with some more writing.